Finally! The first official beer tasting from Chicago’s new Pipeworks Brewing Company. I’ve been watching them grow for what seems like forever, from the Kickstarter beginnings, to our first conversation at Dark Lord Day, until their final launch. A few Pipeworks beers have come out by now, but I haven’t had the opportunity to taste any until now. Making such small batches at a time, they flew off the shelves at locations like Chicago-area Binny’s Beverage Depots. I finally ran across bottles of their inaugural double IPA, Ninja vs. Unicorn, as well as their second beer, the imperial stout Close Encounter, at one of my favorite Chicago bars, Maria’s. All I can say is thank god for Maria’s, which somehow always seems to have things in stock that everyone else in the city has sold out of weeks before. NOTES: 22 oz bomber poured into a tulip glass. Fantastic label art, by the way. 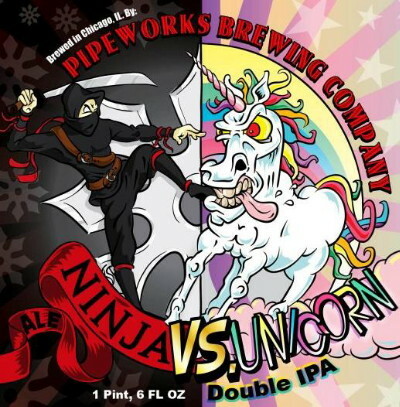 It looks like all Pipeworks beers are going to be fun to look at. APPEARANCE: Very light in color, dark yellow into light gold. Doesn’t look like there’s going to be a lot of crystal malt here. One finger of white foam, not overly carbonated. AROMA: I could smell whiffs of it as I poured a few feet away from my face. With that said, when lifted to my nose, the aroma isn’t quite as strong as I expected. There’s lots of citrus, and I get some biscuit as well. Not hugely hoppy in the nose, though. TASTE: This is where things completely invert. Holy cow, this is a hop-bomb. I was simply not prepared for this. There’s an explosion of citrus and floral flavors. It’s quite dry, as the color would probably have you expect, and the bitterness is bracing. There’s no way I can say anything close to “balanced.” This is just resinous hop goodness with a little booze thrown in, in the style of a DIPA like Pliny the Elder or Stone Ruination, except more zealously over the top. It’s been a while since I’ve had an Avery DuGana, but it’s kind of like that as well, except more dry. MOUTHFEEL: Average carbonation. Pretty heavy with the amount of flavor and bitterness happening here. OVERALL: Great stuff, if hop bombs are your thing. A near-perfect 3.5 hops. I think this beer is really the brewery’s letter of intent, in a way. It’s like a warning shot across the bow–two young brewers saying “Look guys. We are not messing around.” Pipeworks is going to make some bold beers. I know I can’t wait to taste the imperial stout, but I’ll probably save it for a little while. But you can be sure that next time I’m in Chicago I’ll be stopping by Maria’s again, looking for some more new Pipeworks beer. Posted in Tasting Notes.Tagged pipeworks brewing, pipeworks brewing company. The label makes me wonder at what point in the past these two combattants supposedly clashed. They should have written an epic narrative of ninja and unicorn combat on the back.